I am a list making person. I am also a terribly disorganised person masquerading as an organised person and so I make lists to help me keep on top of things. At the moment I am run off my feet with university work and everything else that goes with the never ending run up to Christmas, so I find that I barely have time for sewing. Infact I havent made anything for a while. A long while. However, this doesn't stop me compiling a sewing list - my list of things to sew. I've got three lots of fabric I want to make into shift dresses, which probably won't get done until the middle of November as I haven't actually made a shift pattern yet! Ok, so one pair of the trousers are my dad's (can you guess which?) but the other two are mine. The problem with having a long torso, narrow waist and long legs is that nothing ever fits me properly. Ever. 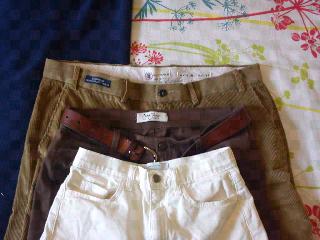 So I have to take the waistbands in on my brown trousers and my dad's cords as he's lost weight (congrats dad!). I've actually taken the waistband of my brown trousers in before in a sew-straight-up-the-outside-seams way, but it digs in like anything so I now have to deconstruct them and re-do them properly! Serves me right for not doing it properly the first time! And I still need to make a pair of narrow leg jeans from scratch so I have something I can tuck into boots when it rains. Damn me and my penchant for flares! Oh and I still need to finish my petticoat with Jenny! Damn you life, always getting in the way of my sewing!